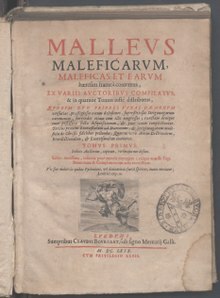 Malleus Maleficarum in a 1669 edition. Heinrich Kramer (c. 1430 – 1505), also known under the Latinized name Henricus Institor, was a German churchman and inquisitor. With his widely distributed book Malleus Maleficarum (1487), which describes witchcraft and endorses detailed processes for the extermination of witches, he was instrumental in establishing the period of witch trials in the early modern period. Born in Schlettstadt, now Sélestat, Alsace, he joined the Dominican Order at an early age and while still a young man was appointed Prior of the Dominican house of his native town. At some date before 1474 he was appointed Inquisitor for the Tyrol, Salzburg, Bohemia and Moravia. His eloquence in the pulpit and tireless activity received recognition at Rome and he was the right-hand man of the Archbishop of Salzburg. The papal bull Summis desiderantes which Pope Innocent VIII published in 1484 acknowledges the existence of witches and explicitly empowers the inquisition to prosecute witches and sorcerers. The bull aimed to reaffirm the jurisdiction of Kramer, who was denied authority as an Inquisitor in Germany. Despite being granted episcopal jurisdiction to conduct trials by Karl Golser, a bishop in Italy, this was later revoked following an unspecified scandal. This most likely referred to the interrogation of Helena Scheuberin in Innsbruck, where Kramer focused heavily on the sexuality of Scheuberin and "presumed much that had not been proved". Kramer remained in Innsbruck to continue the investigation, collect evidence, and interrogate suspected witches. Golser and Kramer exchanged letters encouraging Kramer to quit the investigation, ending with a final letter in 1486 in which Golser ordered Kramer to leave his diocese. Kramer finally relented and returned to Cologne. In response to the criticism of his peers, Kramer began to write a treatise on witchcraft that later became the Malleus Maleficarum (literally "The Hammer of Witches") . The bull Summis desiderantes was included in the forefront of the book, which was first published in 1487. Although this implied papal support for the Malleus Maleficarum, it was later condemned by the Inquisition in 1490. Kramer failed in his attempt to obtain endorsement for this work from the top theologians of the Inquisition at the Faculty of Cologne, and they condemned the book as recommending unethical and illegal procedures, as well as being inconsistent with Catholic doctrines of demonology. He died in Kremsier in Moravia, in 1505. ^ "Institoris" is the Latin genitive case of "Institor" ("retailer"). It was a common practice in those times to take the genitive of the father's name for latinization, but this genitive was used as nominative in Latin texts ("Venerabilis & religiosus frater Henricus institoris"). In German texts this name was abridged to "Institor," according to the custom of omitting Latin endings in translations (cf. "Iuvenalis" – "Juvenal"). ^ Paul Hinschius. Das Kirchenrecht der Katholiken und Protestanten in Deutschland. Band VI. 1897. Reprint Guttentag, 1959. ^ Cheney, David M. "Bishop Karl Golser [Catholic-Hierarchy]". www.catholic-hierarchy.org. Retrieved 2018-09-01. ^ a b Broedel, Hans Peter. The Malleus Maleficarum and the construction of witchcraft : theology and popular belief. Manchester. pp. 17–18. ISBN 1423706471. OCLC 60638482. ^ P. Hlaváček: Velký inkvizitor v soukolí české reformace aneb Heinrich Institoris v českých zemích. In: Via media. Studie z českých náboženských a intelektuálních dějin. Praha, Univerzita Karlova, 2016 p. 71. Reinhard Tenberg (1990). "Institoris, Heinrich". In Bautz, Friedrich Wilhelm (ed.). Biographisch-Bibliographisches Kirchenlexikon (BBKL) (in German). 2. Hamm: Bautz. cols. 1307–1310. ISBN 3-88309-032-8. This page was last edited on 5 December 2018, at 20:20 (UTC).